For anyone even remotely following cloud infrastructure, its been hard to avoid the collision of OpenStack, OpenFlow, and Software-Defined Networking. In less than two years, OpenStack has grown to a community of over 180 companies and over 3000 active developers, offering Apache-licensed software for building public and private clouds. Over the same two years, OpenFlow and SDN have seen similar growth. The Floodlight controller has been downloaded over 5000 times since its launch in January and the Open Networking Summit this past April attracted over 900 attendees (with several hundred more on the waiting list). Simultaneously, Quantum, a networking-as-a-service module, has emerged in the OpenStack ecosystem. Quantum offers a plugin architecture through which multi-tenant virtual networking can be connected in OpenStack. The new service has reached incubation status in the “Essex” release and will be promoted to being a core project in the “Folsom” release in several months. 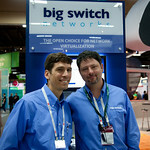 In fact, a couple plugins offering open source SDN services, like Ryu, have begun to spring up as well.